Our design and complete interior renovation in Society Hill receives props in the April 2019 issue of Philadelphia Magazine. 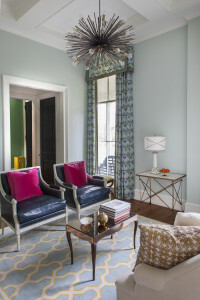 Dubbed “House Cool” by the magazine, this project involved stripping a traditional Philadelphia row home down to the studs to transform it into a fusion of fine craft, spirited whimsy, and continental sensibility. 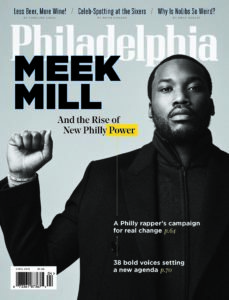 Pick up a copy of Philadelphia Magazine and check out this stunning project! Thanks, Main Line Today, for featuring our Gladwyne house design in your March 2019 edition! The project seamlessly unites an original structure built in the 1920’s with a large addition built 60 years later. Our design includes a blue and white palette to lighten and brighten the living spaces combined with interesting architectural elements like oversized wainscoting to complement the original details of the house. Read more about the project here. After the long, dreary winter many of us have endured, there seems to be a collective gravitational pull in the direction of all things bright, sunny, and cheery. Our homes are no exception. What better way to do that than with flowers? Mona comments on “orange crush” for Matouk. Mona Ross Berman was featured in House Beautiful’s How to Conceal Clutter article. See all the rooms and the full article here. 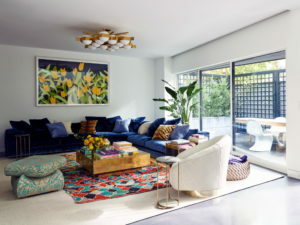 Mona Ross Berman was featured in House Beautiful’s 9 Fabulous Family Rooms article. See all the rooms and the article here. Mona Ross Berman was featured on HGTV’s article “20 Living Room Color Palettes You’ve Never Tried”. See the article here.